Six cute little bird wall decals! 4 standing and 2 flying. 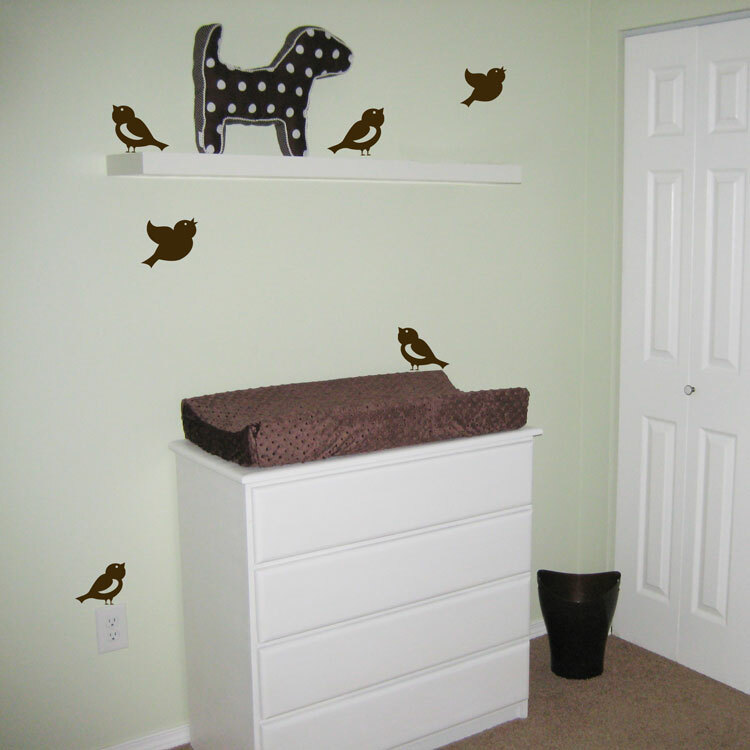 These little bird wall stickers measure between 4 and 5" wide and are great for accenting your room. Shown here in dark brown but available in all of our colors! Seller is AWESOME! Worked with me to creative a custom package that was needed on short notice. Items were shipped super fast and came exactly as described. Install was easy and the rooms look wonderful with the decals. Hope to do business again in the future! Will definately recommend other to visit you! We ordered the "Tree with Swirling and Spiraling Branches" in dark brown. BEAUTIFUL! Great customer service, they marked each piece for us so we knew which was the middle and the top. My husband says, "it looks like paint on the wall.' It took a little patience making sure each piece overlapped correctly and even though we didn't get it perfectly placed, you couldn't tell because the tree was so busy. Customer service at Dali is out of this world. And this is coming from a 3rd generation family business guy. They were super knowledgeable prior to placing my order and after i placed my order the graphics guy Robert had a couple questions about my sizing which he suggested a couple things that made more sense. I would suggest Dali to anyone out there!! GO DALI!!! wanted to say thank you for such great customer service & quick responses! I wanted to also thank you for the extra decal of my son's name. It turned out awesome and I have attached a picture!